W Hotel inspired design in this newly remodeled and fully upgraded designer condo at a value price. Everything is new. Traverine floors throughout. The kitchen includes granite counter tops Italian glass tile back splash, and dishwasher. The bath includes a vessel sink and marble top vanity with a large walk-in shower. All located in the heart of Waikiki one block from the Royal Hawaiian with incredible views from the 21st floor. Enjoy luxury sheets and plush towels. This fully equipped condo includes a designated parking place. I fell in love with Hawaii as a young Naval officer and hope to retire here. My condo in had everything I was looking for. Fantastic location, Views, Parking, Full kitchen, Friendly staff and the building isn't too big. 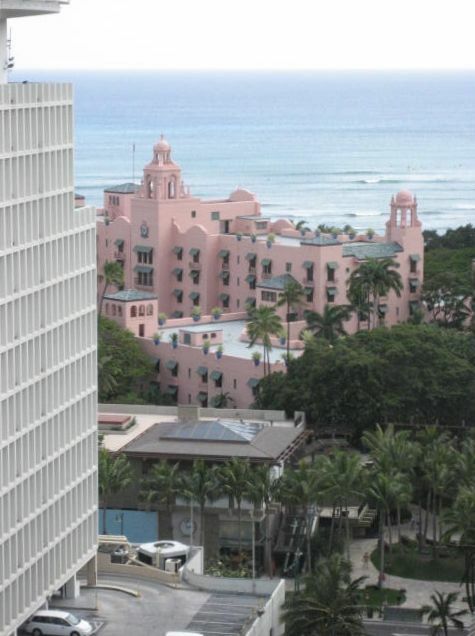 I love waking up and seeing the the pink Royal Hawaiin hotel against the azure water. I could pinch myself. Then I go for a walk and everything is right there. This is becoming our home away from home. We have visited and stayed at Roberts condo more than four times now (in the past couple of years) and have already booked the fifth. It is the only place I will stay and I couldn't recommend it enough. You will not be disappointed I can guarantee you there is no place that ticks all the boxes as this condo does. I only wish I could buy it !!! So pleasantly surprised when we arrived at Marine Surf apartment, it had everything we needed. A beautiful view from the 21st storey, sitting on the lanai enjoying a glass of wine made it so relaxing. Within easy reach to everything, right in the heart of shopping, eateries, and Waikiki beach. We checked out heaps of places and were not disappointed with Marine Surf. The extra items in the apartment beach towels, beach mat, umbrella, snorkel, fully equipped kitchen, very comfortable bed, wi fi, CD's, air con made for a very comfortable stay. We made use of the car park as we hired a car for a few days. Our correspondence with Rob was very easy - we knew exactly what to do upon arrival. Star Taxi service picked us up, had the keys for us and dropped us right off at the front door. The fact we arrived at 10pm did not present a problem at all. A memorable holiday, staying in a great location with excellent facilities. We absolutely love it here and you will also. I have to say if you want to be a step away from the beach, and live with a view that you never want to stop looking at, have everything around you, shopping, restaurants, transport and luxury then this is the place for you . Clean, modern, nice furniture, roomy enough for 2 to stay comfortably. The best part was the location---close to everything. Shops, beach, bus lines. Free parking a great plus. I have stayed other places before but I will choose this place first, if available. Brandie was very helpful in helping us get settled. highly recommend. We spent a week in Robert's very comfortable and clean apartment. The furniture is of very good quality with a very comfy bed, great couch and up market dining setting. We really like having bedside tables for our 'stuff!' The TV is better than what is shown in the photos and can be watched comfortably from the bed or couch. Being from Australia we quite enjoy the different U.S. shows! The kitchen is very well equipped and practical to use. The bathroom is also a great size with a large shower. The area outside the bathroom had great storage, plenty of good quality towels, beach equipment and cleaning supplies. The apartment itself was a bit bigger than expected from looking at the photos. The lanai had comfy chairs and a small table. Views are great but we found it a bit noisy with the construction going on. It can be a bit noisy at night and early morning but I used ear plugs and it didn't seem to bother my husband. The location is great. We walked everywhere. Check in was easy with Brandie who met us near the garage and directed us to our parking stall and familiarised us with the apartment. The Marine Surf building itself is well maintained. The carpet and walls on the apartments level were fresh and clean. The two lifts were clean and quite quick. We never waited long. The foyer too is well maintained, clean and spacious. The pool was nothing fancy and but is true to the photos. There was very good communication with Robert prior to arrival which made us very comfortable with our choice of accomodation. We would have no hesitation in recommending Robert's apartment to friends and family. This condo was a great find. It is very well-maintained, clean and comfy. The owner Rob and the Manager Brandie were easy to get hold of via email or phone. Several weeks or even months before our arrival, they were the ones who really followed up on the details of our flight which was really amazing. It is like they are even more excited than us with our vacation. We felt really welcome. Its location is perfect. Restaurants, grocery and shopping (Ross, DFS Galleria and Kalakaua shops) are just steps away from the condo building. My husband likes to jog along Ala Wai Canal, Waikiki Beach and Ala Moana beach park which are nearby. Parking was included which was very nice. The view from the balcony was amazing. We also appreciate that there are umbrellas, stroller (for shopping), beach towels which were very useful. Wifi is also very good. My husband even said it is faster than our wifi at home. So far, it is the best place we have ever rented. We're hoping to go back and stay at Rob's place if we get a chance to go back. Mahalo Rob and Brandie! The $100.00 cleaning fee will be deducted from the $400.00 refundable damage deposit.